What could be better than sampling beer at a craft brewery on a beautiful Friday afternoon at the Jersey shore. Some would call it playing hooky but I prefer to call it building a good customer relationship. 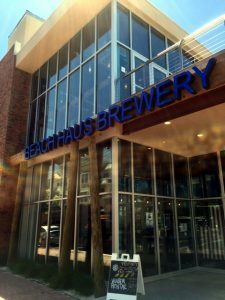 Consisting of a production facility, retail shop and tap room, Beach Haus Brewery is the perfect destination for a sunny summer afternoon. Sitting on the corner of Main St. and 8th Ave, the site of the former Freedman Bakery in downtown Belmar NJ, this brewery is an impressive mix of new and old, glass and reclaimed wood, with a laid back Jersey Shore atmosphere. The brainchild of Brian Ciriaco and John ‘Merk’ Merklin, Beach Haus had its beginnings in a garage in Brick, NJ in 2007. Tom Pryzborwski soon joined the team as head brewer and their first beer, Beach Haus® Classic American Pilsner, was developed reflecting the taste preference of the Jersey shore. Chris McCallion another Jersey shore resident became a partner in 2009 and by 2010 Beach Haus® Classic American Pilsner was being sold through local NJ distributors. Within 2 years, Beach Haus® Winter Rental, Kick Back Amber Ale and Cruiser IPA were released and distributed throughout NJ, Pennsylvania, Connecticut, New York and Delaware. In 2013 the partners purchased a building that housed the Freedman Bakery, a destination for residents and vacationers since the 1950’s, noting that the transition from bakery to brewery was fairly easy given the facility already contained a production area and was capable of handling large equipment and deliveries. Structural changes had to be made to convert the bakery into a brewery but a real effort was made to keep some of the building’s history intact. 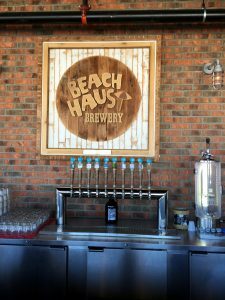 The flooring, bar top, and tables in the tap room are constructed of wood reclaimed from the bakery; as is the Beach Haus sign crafted by a local artist and prominently displayed over the taproom bar. The brewery opened its doors to the public in the spring of 2015 and is enjoying great success. We showed up unannounced on a Friday afternoon and true to the beachy laid back style reflected in the brewery, we were quickly offered a tour. Our tour guide ended up being one of the original founders, John Merklin. We explained that our company, Assured Automation supplied over 20 automated valve assemblies to the design firm that engineered the 30 BBL, 4-Vessel brew house. John was soon called away but the very capable Dylan Kohan shared the details of the brewing process. The process begins at the hopper and super sack where bags of specialty and bulk grains enter the system and move into the roller mill where they are crushed and then sent to the grist tank where they sit overnight. The milled grains, typically malted barley and supplementary grains, are then transferred to the mash mixer where the initial brewing activity begins. The grains are mixed with warm water to extract their natural colors, flavors and sugars. This mashing process allows the enzymes in the malt to convert the starch in the grains into sugars, typically maltose, to create a malty liquid called wort. The wort is separated from the spent grains during the two stage lautering process that occurs in the Lauter tun. Being ecologically minded, the spent grains are saved for a local farmer who feeds them to his livestock. In the wort kettle, the wort is brought to a boil; hops and other flavorings are then added and held at a rolling boil for 45 to 90 minutes. Many important chemical reactions occur during this stage; hop flavors are released, bitterness and aroma compounds are developed and the wort becomes concentrated. At the end of this boil, the trub or solid hop particles are separated out of the wort in the whirlpool. After the wort passes through the wort chiller it goes into a fermentation tank where yeast is added and fermentation begins. The sugar from the malt is converted into alcohol and carbon dioxide and the product finally can be called beer. The beer is then filtered to remove yeast and other solids and piped into the brite tank where carbonation is added and the final product is achieved. 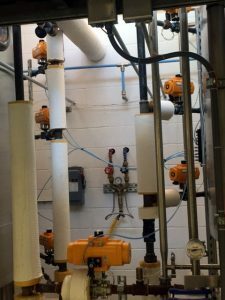 As we walked through the brew house, it was fairly easy to spot the bright yellow color of our pneumatic actuators. 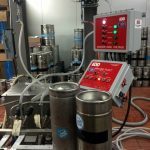 Assured Automation automated valve assemblies are used throughout this beer making process. Pneumatically actuated P2 Series PVC ball valves are used on water lines, 36 Series stainless steel 3-piece ball valves on steam lines, and tri-clamp butterfly valves on process lines. The P2 Series offers some unique features over standard PVC valves. The patented dual block system locks the union ends, which prevents them from loosening due to vibration. This is a common problem with other PVC valves and often results in leakages. The P2 also features a dual stem seal making this design optimal for valve actuation. 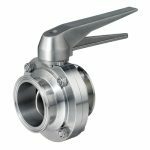 The 36 Series ball valve is constructed of 316 stainless steel. 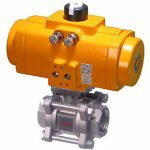 The superior stem seal design of this 3-piece ball valve provides increased cycle life making it the perfect choice for automated valve package designs. The Teflon stem packing is live loaded with Belleville washers to provide constant tension on the stem seals. This ensures a bubble tight stem seal and increases the life cycle of the seal even in high cycle applications. The BFY Series Tri-Clamp Sanitary Butterfly Valve meets all 3-A, FDA & USDA standards and requirements. 316L mirror finish disc provides an even flow preventing obstructions and restrictions. An “opposing” body bolt design prevents the loosening between body sections due to usage or vibrations. Bolting is flush with body surface preventing obstruction during actuation or when space is limited for installation. At the end of the brewing process, the product is either bottled or kegged. Kegging occurs at at the Mini King brew system, an automatic keg washing, sterilizing and filling system for Sankey style kegs designed and built by IDD Process & Packaging, Inc.
A row of Assured Automation tri-clamp high cycle life angle valves are used for steam, water and process filling lines on the keg cleaner/filler. Teflon seats and seals and tri-clamp end connections make these angle valves ideal for this application. 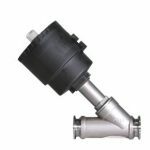 This Angle Seat Valve is a 2/2-way pneumatically actuated piston valve for liquids, gases and steam. The superior design of the piston is unique to the market, enabling the plug to retract farther from the flow path, ensuring the highest flow capacity. The dual packing design, and a large diameter self-aligning stem insures the highest cycle life. 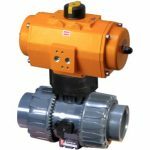 The wetted parts are all stainless and teflon, which makes this an excellent valve for sanitary food grade applications. This angle valve has been used in applications achieving 5 million cycles. At the conclusion of the production facility tour we were escorted to the taproom where we had an impressive selection of different brews from which to choose: wheat, blonde ale, shandy, stout, pilsner, IPAs, porter and lager. 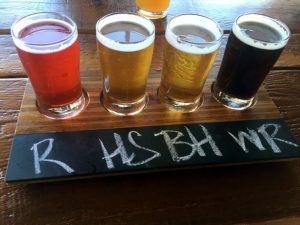 It was a difficult choice but we decided on a flight which included the summer test beer, a strawberry shandy, called Radler, as well as High Side American pale ale, Beach House classic American Pilsner and Winter Rental black lager. We also enjoyed a pint of the tribute beer, Herb’s Rye. This American wheat is made with rye malts and pays homage to Herb Freedman, owner of the former Freedman Bakery, who was known for his rye bread. This entry was posted in Food/Beverage, Latest News and tagged 36 Series, Angle Valves, beer valves, brewery valves, P2 Series, Stainless Steel Butterfly Valves, valves for craft brewery. Bookmark the permalink.